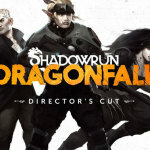 Although technically a DLC, Shadowrun Returns: Dragonfall is actually it’s own individual campaign for the Shadowrun RPG, which was released last year. While Dragonfall smartly doesn’t change the system that that the original established, which is a greatly simplified version of the pen and paper game, it does add lots of elements. You will now take on side quests, build up a home base, explore multiple approaches to missions and develop characters beyond just the main hero. 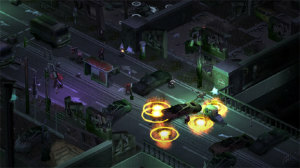 Dragonfall takes place in Berlin, and is separate from the Dead Man’s Switch campaign in Seattle. You will be generating a new character for Dragonfall, so it’s a good chance to try a new class that you didn’t get a chance to experiment with in the original. Or make a character archetype that you are familiar with, the choice is yours. One thing is that your character is supposed to be from Germany, which exists as the nebulous F-state these days, a sort of socialist paradise where even corporations fear to tread too strongly, so giving your avatar a little German flavor might be a cool touch. My dwarven street mage went by Herr Maus, a fact that brought me more than a little giggle from time to time. Some of the bad guys set up good tactics to try and stop you this time around. So the system pretty much remains unchanged, which has all the flavor of the Shadowrun pen and paper RPG, but not any of the over complexity, especially with the magic system, that made it a bit of a bear to try and play, much less run, with a group of pen and paper players. That said, the original computer game was a bit linear in nature. You pretty much followed the main game to its conclusion, and while the final plot twist was something to think about, there weren’t too many other surprises along the way. Dragonfall adds in that intangible element that takes RPGs, and especially ones set in shadowy conspiracy-filled worlds, to the next level. 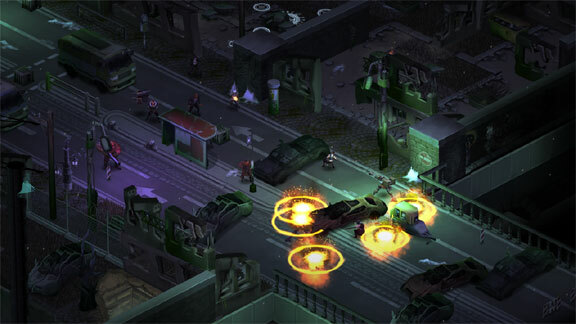 As part of Dragonfall, you will encounter various characters who live in a little closed-off neighborhood in the middle of Berlin where you and your team of runners make their base. Things aren’t perfect in your home town, but they are pretty good compared to lots of other places. And, as you adventure, you will have the opportunity to make things better, whether that means taking on side quests for various residents, improving the local metahuman homeless shelter or even discovering some surprising residents in town that you didn’t know lived there. Players like me who really get into a setting will start to see the quaint little place as home. The developers realized this, and sometimes put players in a position where things need to be done to protect the peace, a nice touch that has little to do with the main mission. 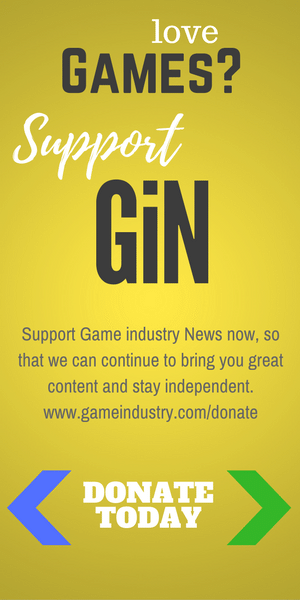 Another brilliant move is giving players an overall goal, in this case to raise a certain amount of money. You progress down the main story to a point, but then have to stop because you have to purchase something that is really expensive. The only way to earn the needed credits? To take on side missions in true Shadowrunner style. These missions are all highly complex and take you to a variety of locations, and each one is crafted well enough that it could be a centerpiece for it’s own campaign. Do as many of these missions as you like, or as many as you need, to raise the money required to continue on the main campaign. 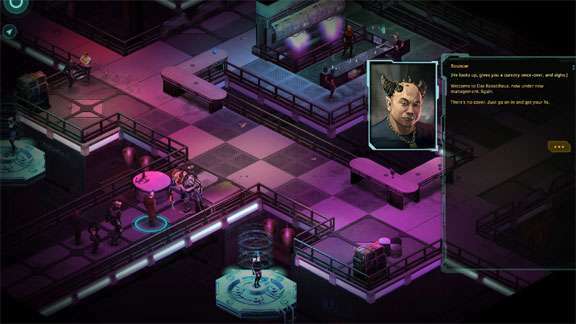 Next to a Stuffer Shack, nightclubs are the ultimate playground for any Shadowrun adventure. The missions also differ by type, with many being straight up fights, while others can be solved with stealth or subterfuge. The roles of every type of class are useful too, from deckers to mages, street samurais to shaman. Whatever character a player chooses to play, there will be places where they can shine, and places where the rest of the team can step up and be a hero too. It’s a really great balance which was absent from the first game. There are also several surprise missions that pop up which aren’t planned. When you fall into some of them, the uncertainty and the lack of preparation really adds to the tension, which is a nice touch. Quite a few surprises await in Dragonfall, and not just with those pop-up missions either. Your team is now also actual main characters themselves, not just mercs you hire out from mission to mission. While you can hire runners from a small pool if you need a skill that your team simply doesn’t possess, you have an actual team that you can work with as well. Not only are they free to hire (though they do take a cut at the end) these team members all have different relationships with your main character. 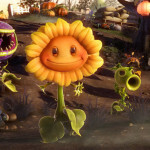 Some of them start off rather cool towards you, and need to be won over with dialog and even special missions. To varying degrees, each team member’s back story is highly interesting. In all cases getting to know them is a big part of the fun of this new module. The gameplay itself is difficult but not impossible, just like the first game. Thankfully there are no invincible sci-fi bugs in Dragonfall, but you will find places where your team is facing some pretty heavy odds. The game does a good job of letting thinking players even the balance, either by placing strategically valuable items around the map like exploding barrels or summoning points, or by letting a decker turn the defenses around on the bad guys or letting a rigger slide a robot behind the lines. Those types of things will reward those who pay attention to the maps. And there are competing interests now for some missions, where a runner has to choose which client to make happy, which to screw over, and sometimes a choice between right and wrong where wrong normally pays better. 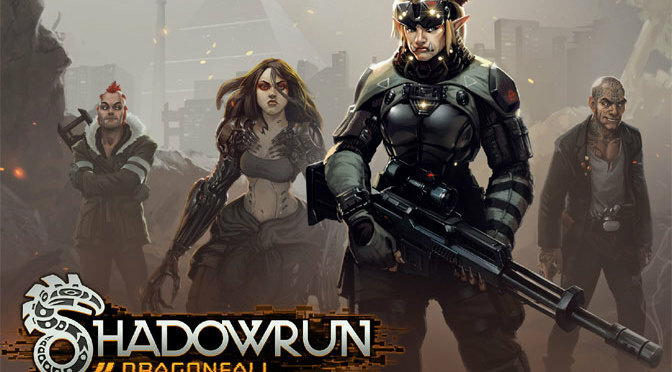 That’s epic Shadowrun for sure. Like the XCOM series did with their Enemy Within DLC, Dragonfall adds timed objectives to some of the missions. Normally I don’t like to have a stopwatch hanging over my head, but in a turn-based game, it can make things exciting. Can your decker get the info and get out of the matrix in just four more turns? If not, it’s going to be really hard to defend him from a reaction team. Stuff like that happens in Dragonfall fairly often, though thankfully it’s not overused. The main plot of the game is engaging, and one really feels like the fate of the world, or at least the F-state, could hang in the balance. 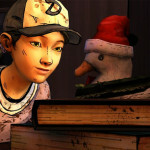 Plus, the world seems to close in nicely on the main characters too, adding to the sense of urgency to get the job done. There is about twelve hours of gameplay packed into Dragonfall, though that could be a bit longer for some players and shorter for others depending on how many side missions are attempted, and how much money is raised and how quickly. The original Shadowrun Returns was a good game. And some of the user-generated content has been pretty good as well. But Dragonfall really puts everything else solidly into competition for second place. It’s the same great conversion of the Shadowrun system, but all the elements that make up a good RPG have been added or enhanced. It’s like adding cyberwear without losing essence, a true feat for the ages.